Australia has made meaningful progress on reducing risk to lives and property in the wake of the Grenfell Tower disaster. But this will be cold comfort for building managers trying to work out what they need to do with properties that are already fitted with cladding. Recent amendments to the National Construction Code (NCC) require external building coverings to pass more stringent fire safety tests. Should a panel with combustible properties that has satisfied these fire safety tests be chosen for installation in new buildings of three storeys or more, sprinkler systems must be installed. This is a step in the right direction. The building code used to be more open to interpretation, allowing for cheaper combustible aluminium composite panels (ACPs) with a flammable polyethylene core to be used if justified as a workaround. No sprinklers or stringent testing was needed. Under new, stricter rules, the costs associated with implementing sprinkler systems make ACPs a less attractive option for construction companies. The amended code – which sets out minimum requirements to meet safety, health, amenity and sustainability standards when designing or constructing new buildings or renovating old buildings – came into effect on 12 March. Standards will continue to evolve and may yet become more stringent still. As the chief engineer for FM Global, a leading commercial property insurer, I’m working with Fire Protection Association Australia providing feedback on its new residential sprinkler standards proposal that is referenced in the draft 2019 edition of the NCC. The draft requires that all residential buildings (Class 2 and 3) over three stories and up to 25m are to be sprinkler protected to the existing Australian Standards or the more cost effective FPAA Standards. Note that buildings over 25m already need sprinkler protection. Anecdotal evidence suggests many developers of high-rise buildings are already choosing to steer clear of ACPs. They’re using 100 percent aluminium panels instead of composite alternatives, regardless of the fact that this more onerous code is only just coming into effect this month. This all bodes well for improving residential and commercial building fire safety. Unfortunately, these new rules don’t address what’s to be done with the thousands of buildings at increased risk of fire because of existing ACPs on their facades. That’s because the NCC doesn’t apply retrospectively. How building managers should best respond to the Grenfell Tower tragedy remains an open question. Even those with best intentions can find themselves paralysed by choice or rushed into poor decisions based on bad advice. Building managers are justifiably confused about how to assess whether their properties are at risk from ACPs. This is part of the reason why I’ve worked with the Insurance Council of Australia to promote the Aluminium Composite Panel protocol. It provides much needed guidance on identification, evaluation and resolution around this type of cladding. There’s a huge information gap that needs to be filled. There’s clear evidence that some advice doing the rounds is not fit for purpose. Wall-drenching sprinklers are primarily designed to reduce exposure of a building from a fire source some distance from the building, rather than a fire within the building itself. For other proposals, like creating fire breaks by removing certain composite panels, there’s no research yet to prove that these are reliable and effective solutions. There’s simply been no thorough work completed yet on what ratio of panels should be removed so any decision to act on this advice is premature, unless it is very conservative as indicated in the NFPA Facades Assessment Tool where the ACP is no more than 20 percent of the floor to floor height. Building managers looking to do the right thing must not rush to judgment. For now, the only sure way to eliminate ACP risk is to entirely remove them. Alternatives to very costly full-scale removal and replacement of ACPs are being developed by specialists in the Insurance and Fire Safety Engineering fraternities and involve a number of steps post confirmation of the ACP type. The steps involve the identification and removal of any immediate fire exposures close to, touching or within the ACPs. 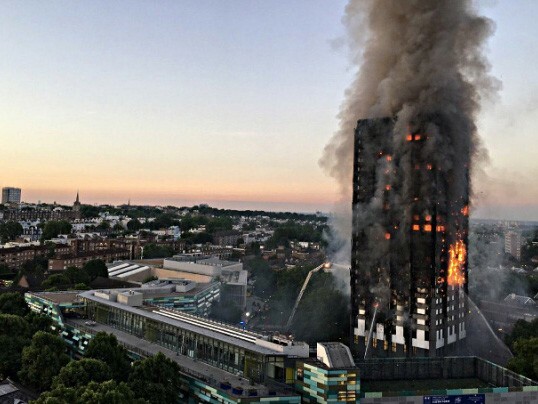 This would be followed by replacing all panelling at ground level, around balconies or accessible roof areas, where fire exposures could easily be introduced (or exist and can’t be removed – plant and equipment). Taking away panelling that sits within at least three metres of the ground, will greatly reduce the risk resulting from something catching fire next to or nearby. Dealing with the remaining façade ACPs will depend on the residual risk and building managers will need to consult with their insurer, fire safety engineer, fire brigade representative and their building surveyor in the development of the final solution. As the tragedy at Grenfell demonstrated, lives remain at risk and time is of the essence. Amendments to the building code are a major step forward for new buildings but following the phased approach will help reduce the risk in a considered and more practical way. cladding fires Grenfell Tower .